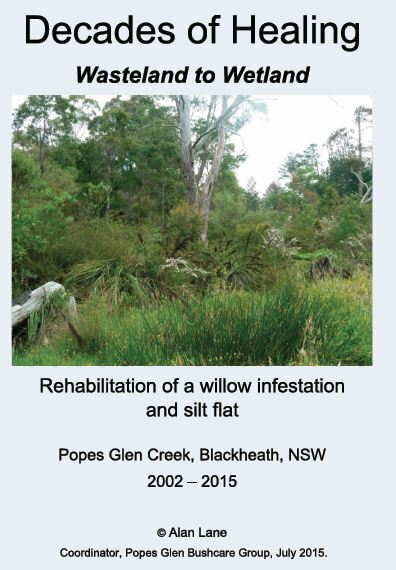 This page contains links to various publications relating to Popes Glen Bushcare Group, the Popes Glen Worksite and general information that might be useful to other Bushcare and Landcare groups. (the Popes Glen Bushcare Group Story) has now been published. This is the inspiring story of how the Popes Glen Bushcare Group, supported by their local Council and grants from the Environmental Trust of NSW, turned a highly degraded peri-urban creek, silt flat and willow forest into a wetland filled with native vegetation, birds and frogs – a thriving Blue Mountains Swamp. With over 100 pages of informative descriptions and photographs “Decades of Healing” details how commitment, patience and adaptive management were used to tackle a seemingly impossible challenge and bring about environmental change. Project Reviewer for the Environmental Trust of New South Wales. Greater Sydney Landcare Network Inc. (GSLN) has published the book and it is available through bookfunnel in pdf, MOBI (for Kindle readers) and EPUB formats via the link below. This is an article published in the journal of Ecological Management & Restoration (EMR) on revegetation. And a related article published in EMR on stormwater management. Birdlife in Blackheath is a small brochure about Popes Glen website and our bird habitat projects. A companion brochure on more general bird habitat creation and maintenance in the Blue Mountains area is also available. Sharing Bushcare Energy video interviews are now available for viewing on Greater Sydney Local Land Services YouTube library. The interviews include Alan Lane talking about Popes Glen and Paul Vale talking on Popes Glen and wider issues. You can also see other Bushcare volunteer interviews and a clip about South Lawson Bushcare. Click this link to see the choices.